South Korean President Moon Jae-in and New Zealand Prime Minister Jacinda Ardern agreed Tuesday to further enhance their countries' cooperation in various areas, including trade and Antarctic research. In a summit held in Auckland, the two leaders also agreed to boost their cooperation in the defense industry. 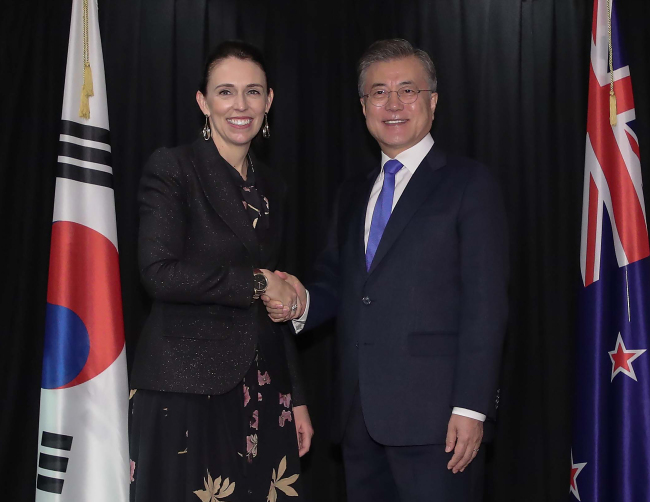 "While noting that the South Korea-New Zealand FTA that went into effect in 2015 is providing a strong institutional foundation to promote trade and investment between the two countries, the two leaders agreed to develop more cooperation projects that would benefit their people in the agriculture industry, where New Zealand has strength, and the infrastructure and construction sectors that South Korea enjoys leadership in," Moon's presidential office Cheong Wa Dae said. "The two leaders also agreed to work for an agreement on cooperation in military supplies so the countries' cooperation in the defense industry will be further expanded," it added. In a joint press conference that followed the summit, President Moon said the countries will work to further develop their relationship. "Today, we agreed to develop the countries' relationship to be more mutually beneficial and future-oriented while sharing the common goal of people-centered values," he said. The leaders also welcomed the scheduled launch of New Zealand's new South Korea-made military supply ship in 2019. Moon arrived here Sunday following his trip to Argentina for the Group of 20 summit. Moon and Ardern emphasized the need to combine the countries' strengths in various areas, including bio, health care, ICT and Antarctic research. They also discussed ways to further expand the countries' people-to-people exchanges. To this end, the leaders agreed to consider introducing a new leadership exchange program for the countries' young leaders. Moon, who is on a state visit, explained the current security conditions on the Korean Peninsula, including the outcome of his three inter-Korean summits with North Korean leader Kim Jong-un this year. "Prime Minister Ardern welcomed our government's efforts to establish peace and promised to continue actively supporting our efforts. It will be a great help in our journey toward peace," Moon told the press conference. "In addition, we agreed to develop a free and fair market economy and enhance global trade order to help ensure prosperity and sustainable development of the international community," he added. The president said he has also asked the New Zealand prime minister to visit South Korea in the near future.